Publisher: Robert A. Musson, 1997. Spiral Bound, 265 pages, 8.5 x 11. A definitive history of the brewing industry in Akron, Ohio. Great detail on all facets of beer making in the Rubber City. 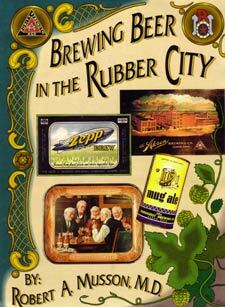 Profusely illustrated with images of Akron's favorite old-time brews like Burkhardt's, Grossvater, White Crown and many others.